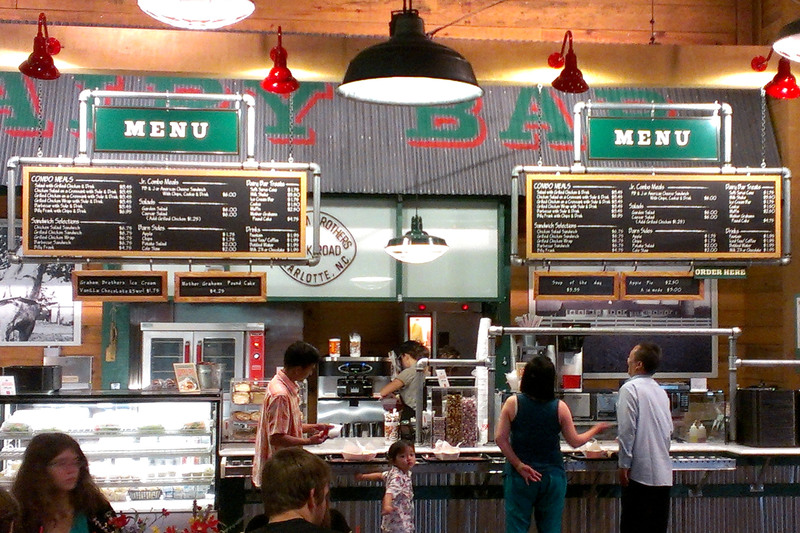 When building or redesigning your retail store, it's important to think about the look and flow of the store. 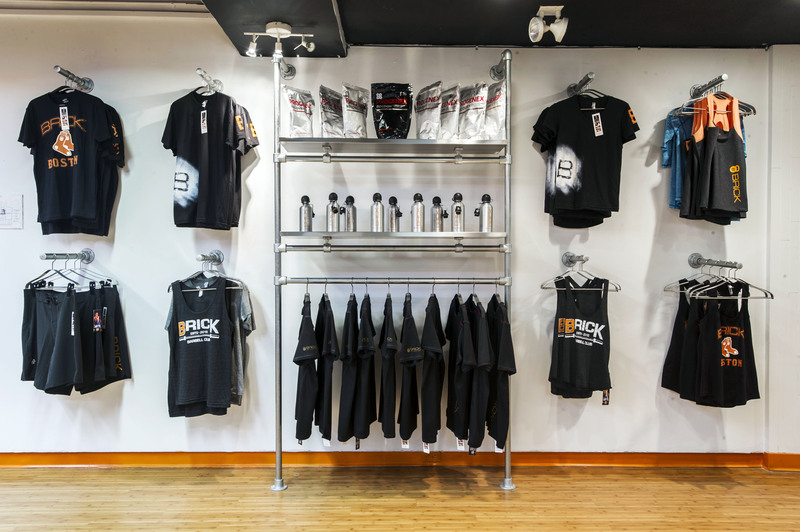 You want your merchandise to be showcased properly and your displays to match the aesthetics of your brand. You also want all of that in a high-quality and affordable package. 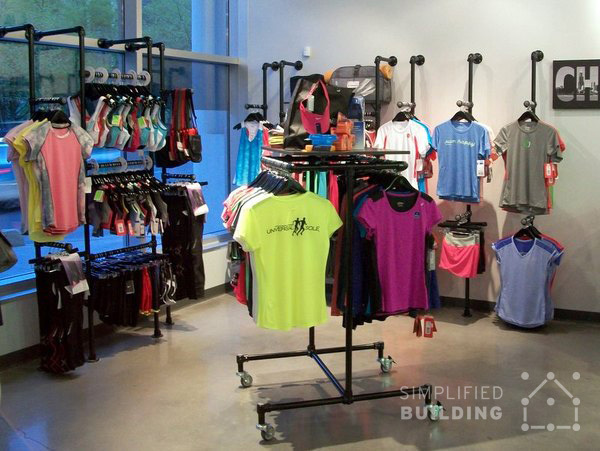 These 39 retail display ideas are all built using Kee Klamp fittings and pipe (or one of our Kee Klamp clothing rack kits) to create a stunning look, super sturdy structure, and a long-term solution at an affordable cost. 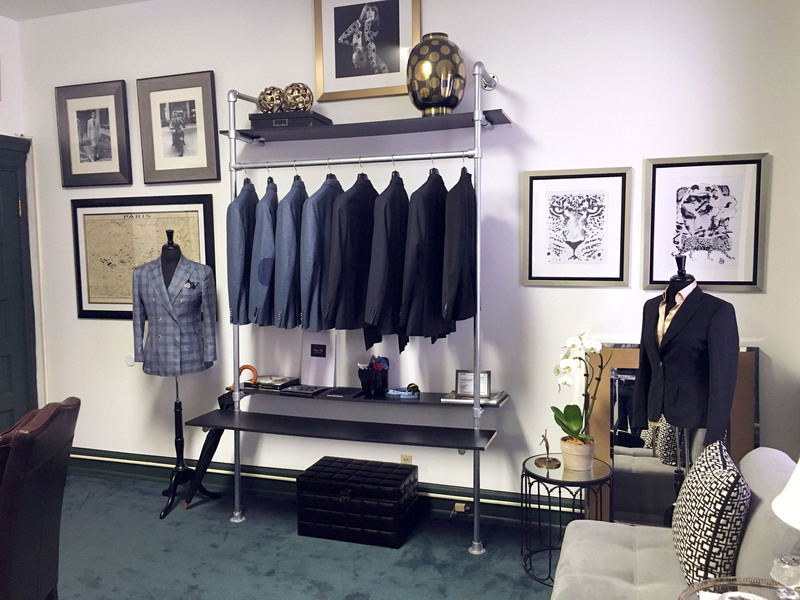 This wall mounted clothing rack features pipe that was painted black while the fittings were left in their original, silver finish to create a unique look for this showroom. Todd built this clothing rack because he wanted something unique, stylish, and modern. "The design of the rack had to fall in line with our design philosophy which is consistency and purpose" said Todd. Read more about the project here. 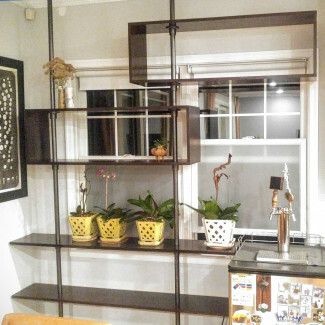 This unique design makes use of the Rail Support fitting to support the shelves and create a "floating" appearance. 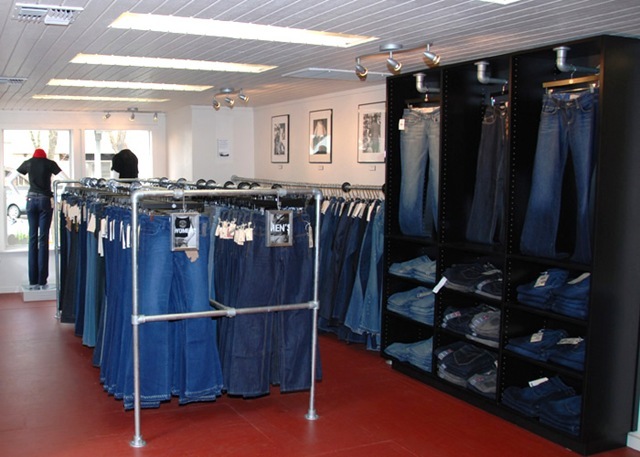 It also features a "winding" design to hang the store's jeans by making use of the Hook fitting. 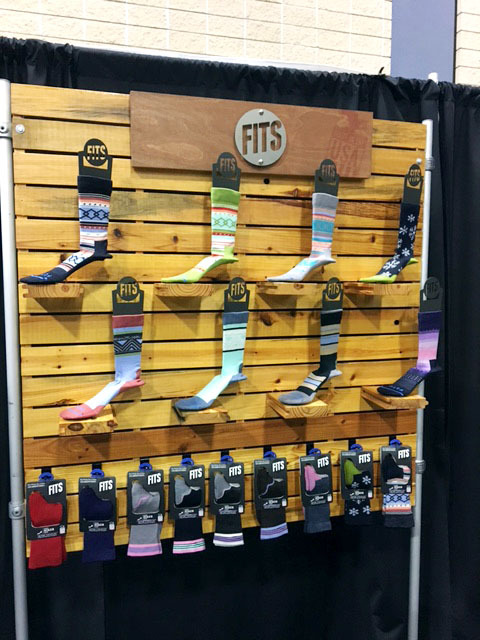 This fixture uses Kee Klamp fittings and pipe to create a stand and attach the pallet-style display to showcase this store's collection of socks. The display is attached to the pipe using the M50 fitting. This clothing rack by Philippe Hass Bespoke Tailoring is mounted to the wall and ground using the Flange fitting. It also features incorporated shelving made possible using the Single Socket Tee fitting. The rack is 5 ft. wide by 8 ft. tall. Again, this rack is attached to the wall and ground just as the previous example. However, rather than simply resting the shelves across an intersection made in the rack, this design makes us of the Rail Support fitting to attach the shelving and create a "floating" appearance. Finally, single wall racks are created on both sides using a Flange fitting, length of pipe, and a Malleable Plug to cap off the pipe. This clothing rack is also attached to the wall and ground using the Flange fitting. The horizontal bar for hanging clothing is created using the Single Socket Tee fitting. Finally, a shelf at the top is attached to the frame using the M50 fitting. 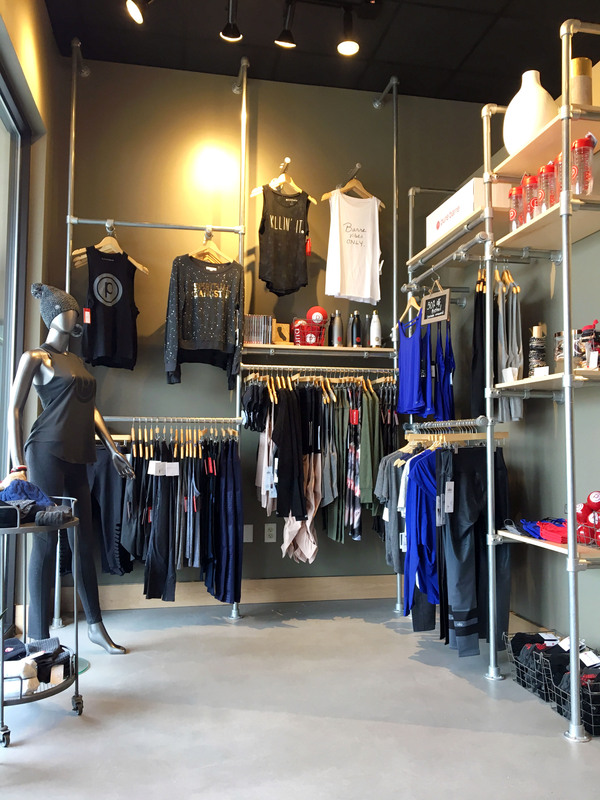 This wall mounted clothing rack at Pure Barre Roseville spans nearly the entire height of the wall. It's quite an elaborate design that incorporates bars for hanging clothing and integrated shelving. The rack is attached to the wall using the Flange fitting and shelves are added by placing boards across intersections made possible using the Single Socket Tee fitting. "I had seen projects on your website and heard great things from other Pure Barre studio owners across the country. I had limited wall space and wanted to utilize my space to the best of my ability to showcase items from our retail boutique. Acton was awesome helping to design the look and layout, including several revisions going back and forth on ideas. Customer service, help in design, and the speedy process from design to shipping was incredibly beneficial. I truly appreciate your help and support!" A few different designs here that all feature the pipe painted black and the fittings left in their original, silver finish to create a unique look. It pairs wells with the pallet wall. 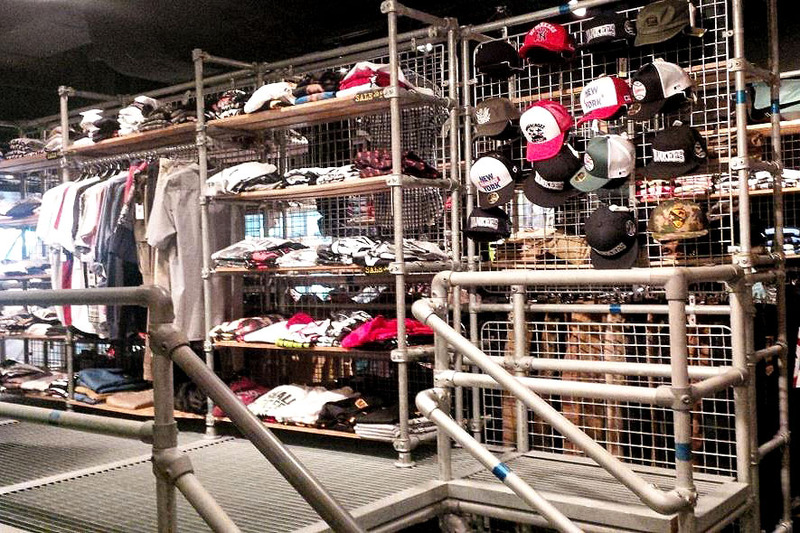 The racks are used to hang clothing, showcase motorcycle helmets, and display shoes. 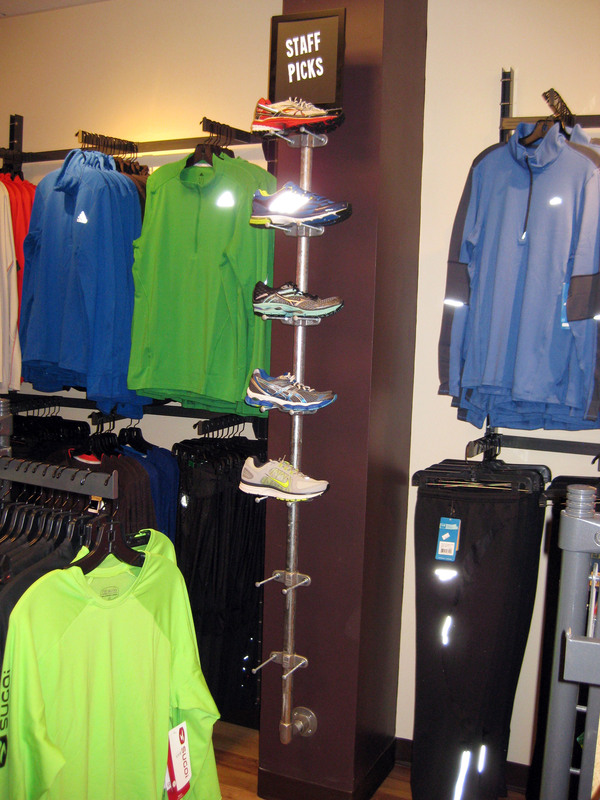 The owners appreciated the simplicity and ease of use of using Kee Klamp fittings to build the displays. 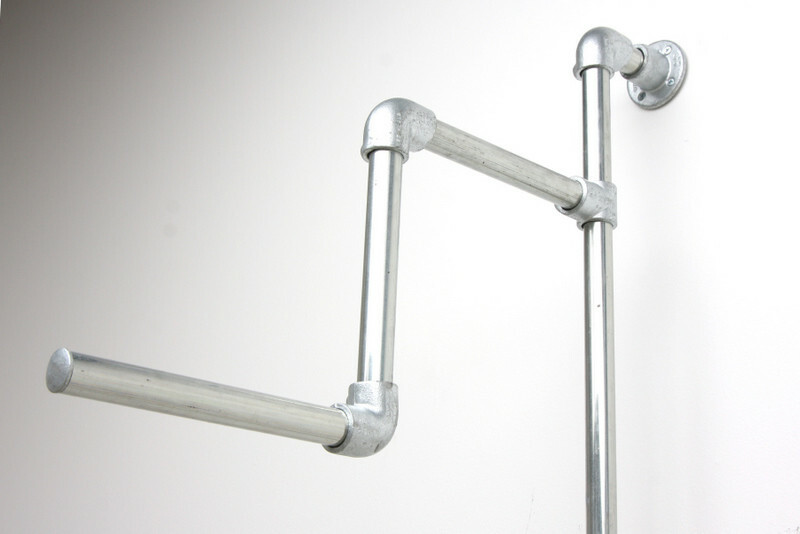 This clothing rack is mounted to the wall and ground using the Flange fitting. The rack is a completely integrated design that spans nearly the entire length of the wall. A different style than many on this list so far, these clothing racks feature a "winding" design to create a unique look. The racks are mounted to the wall and ground using the Flange fitting while a 90 Degree Elbow fitting is used to create the bends. A Collar fitting is used at the very end of the rack to prevent clothing from falling off the rack. To make it easier, we even have a clothing rack kit for this exact setup. 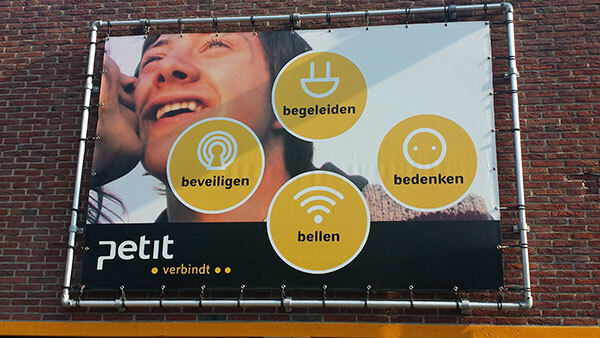 Again, we can see a similar design here as in the previous example. In addition to the wall mounted racks, a free standing shelving unit is also created using Kee Klamp fittings. Flange fittings are used for the shelf base. The Side Outlet Elbow fitting and 90 Degree Side Outlet Tee fitting are used to create the corners in the shelf frame. This unique rack is used to display shoes and is mounted to the wall using the Flange fitting. 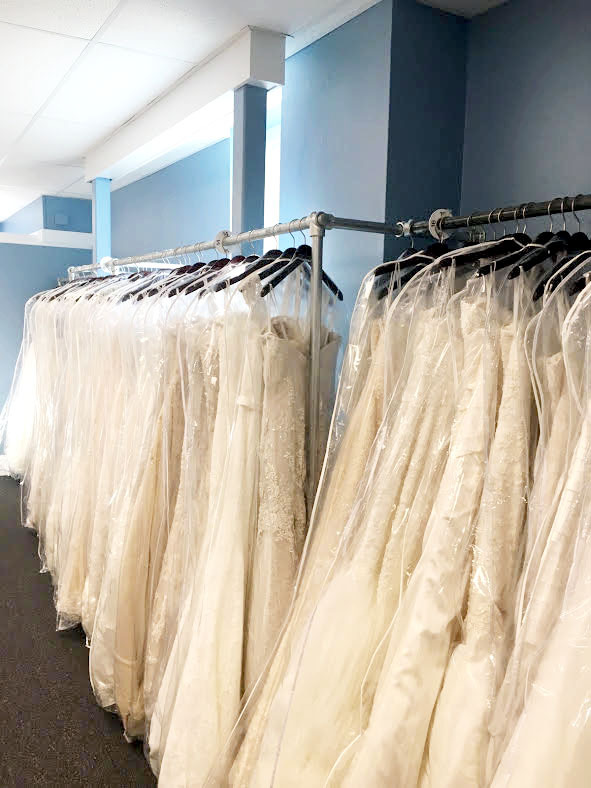 This wall mounted clothing rack is used to display wedding dresses. The 90 Degree Side Outlet Tee is used to change directions in the rack frame. 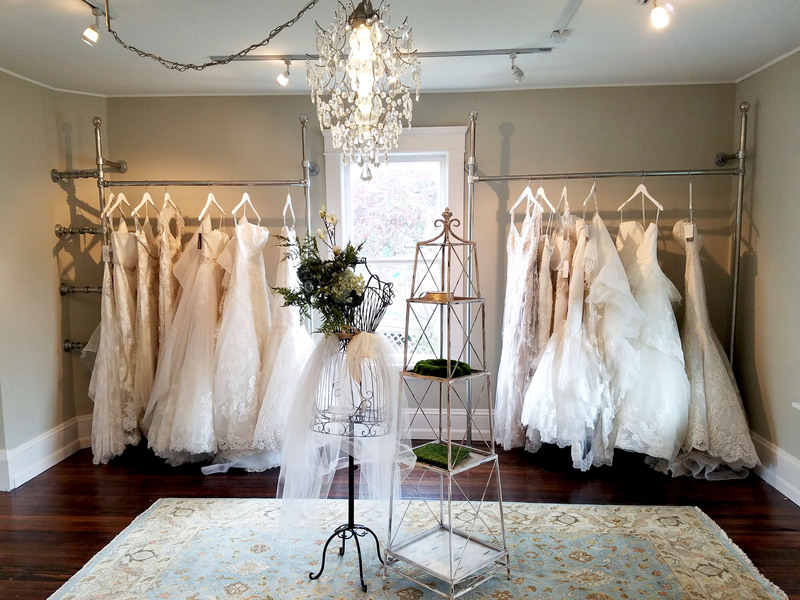 Again, this clothing rack is also mounted to the wall and used to display wedding dresses. The rack is mounted to the wall and ground using the Flange fitting. "The racks are rock solid" said the owner. 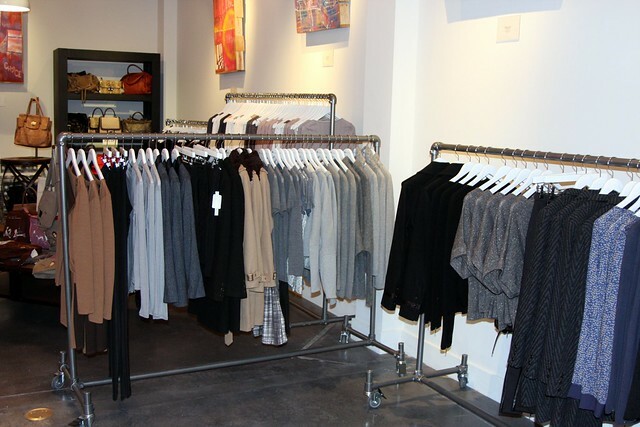 These clothing racks are featured in Beige's retail stores. They're mounted to the wall using the Flange fitting and a Single Socket Tee fitting is used to connect the horizontal bar. I'm not sure you can exactly say this one is technically attached to the wall, but it is a unique design to say the least. 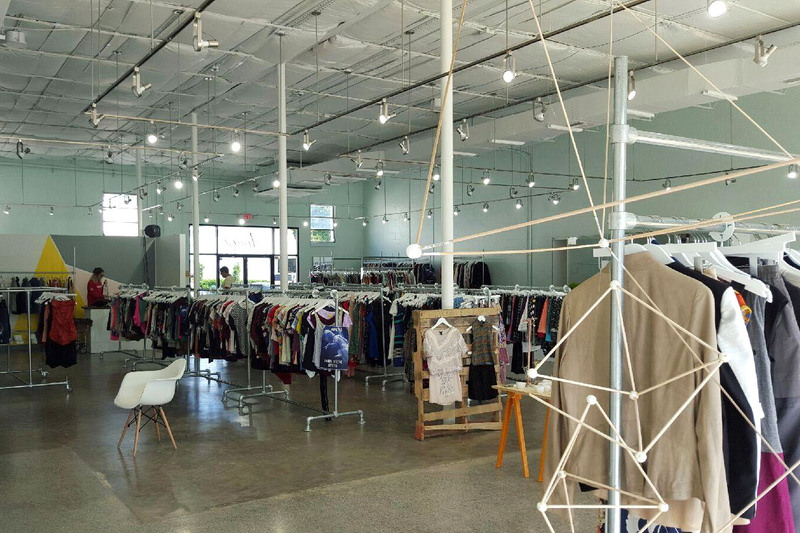 An entirely integrated design, these sets of clothing racks are paired with a wire fencing to create an industrial, urban vibe. Kee Klamp fittings are also used to create stair and safety railing inside the store. These clothing racks are attached to the wall and ground using the Flange fitting while the 90 Degree Elbow fitting is used to created bends in the rack. A Malleable Plug is used to cap off the ends of pipe. 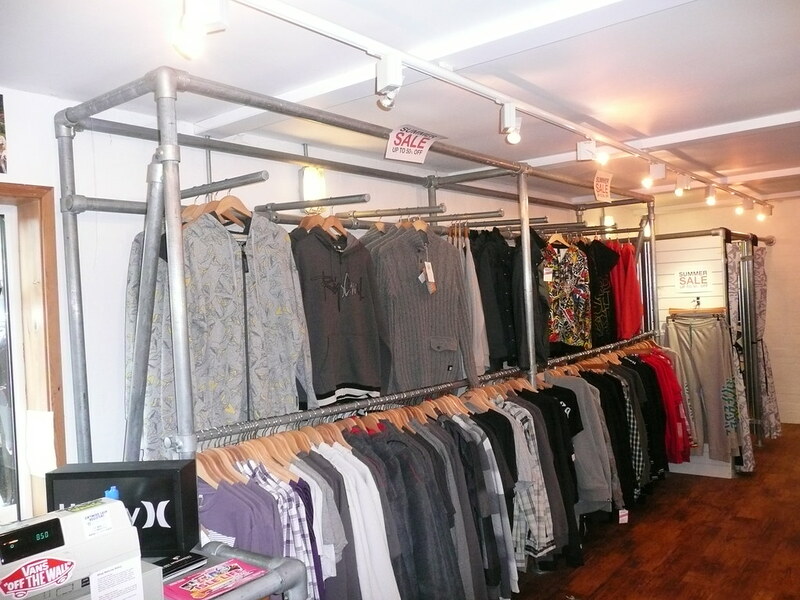 These clothing racks featured in Laced Up retail stores are entirely free standing and feature a bar for hanging clothing. They also feature an added shelf for displaying shoes. The base of the clothing rack is created using the Flange fitting while the 90 Degree Elbow fitting is used to create the bends. 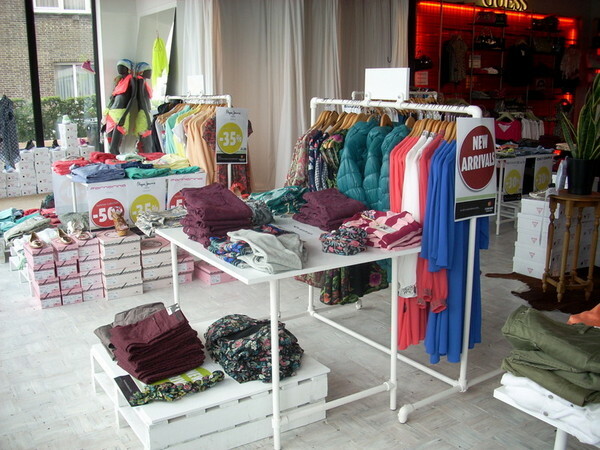 Various display levels are created in this store to showcase their clothing. 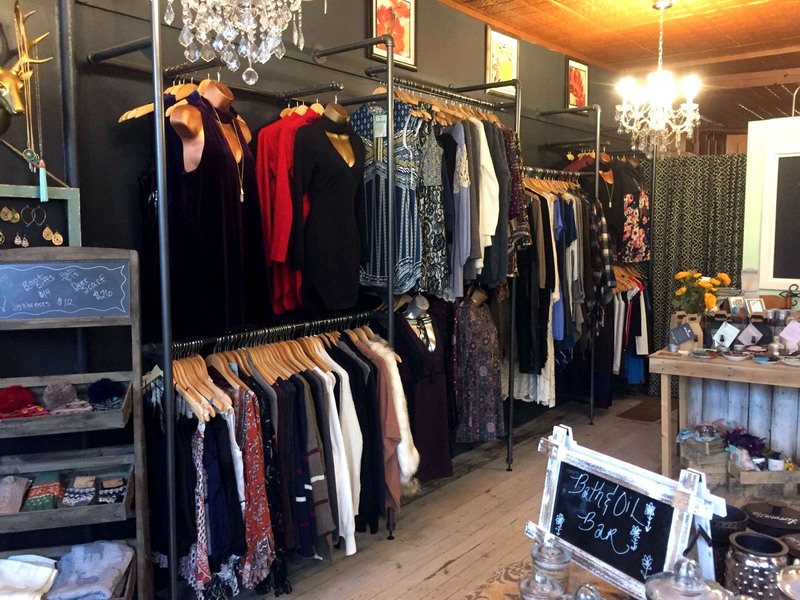 A wood pallet creates the first level, an industrial pipe table creates the second, and an industrial pipe clothing rack creates the third. This makes it easy for customers to spot the clothing they like. The all white finish is prominent throughout the store and helps to give it a clean, modern vibe. "We are a traveling custom shirt printing shop! 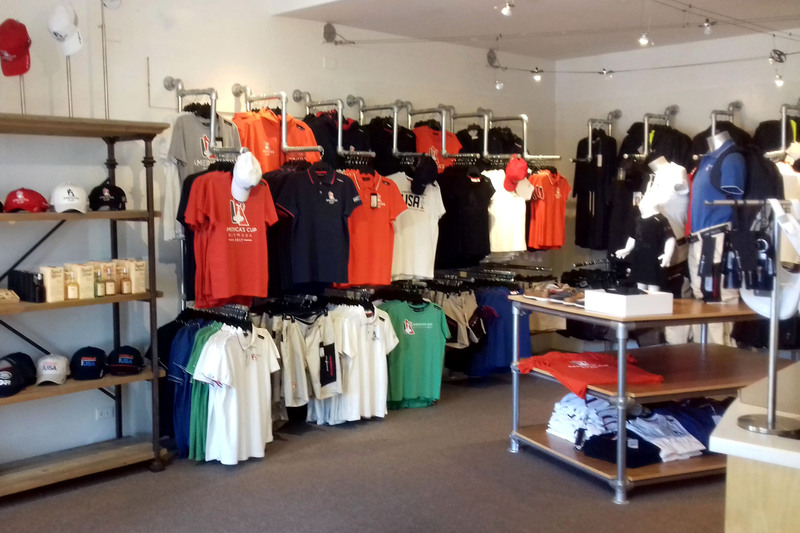 We needed a simple on the go solution to set up a complete shop at events and trade shows that could function as a fully functioning store and printing area. I was co-owner of Imagination Athletics previously, another company that was using these parts. My husband built the displays for that company and continues to build all of our displays and fixtures for Shirt Traveler using the Kee Lites. HE LOVES THEM. We absolutely love your product and will continue to use them in our business and home projects! We'll always use them where ever we can!" These clothing racks feature a "box-like" appearance made possible using the 90 Degree Elbow fitting, Side Outlet Elbow fitting, and 90 Degree Side Outlet Tee fitting. 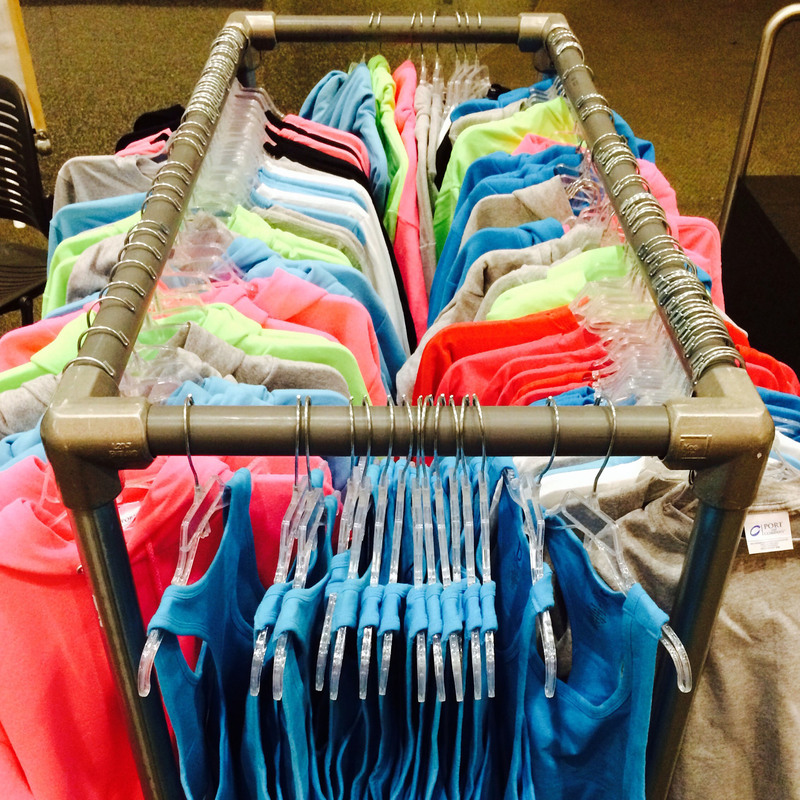 These clothing racks make use of our Single Bar Clothing Rack kit. These kits are free standing and feature a single bar for hanging clothing. 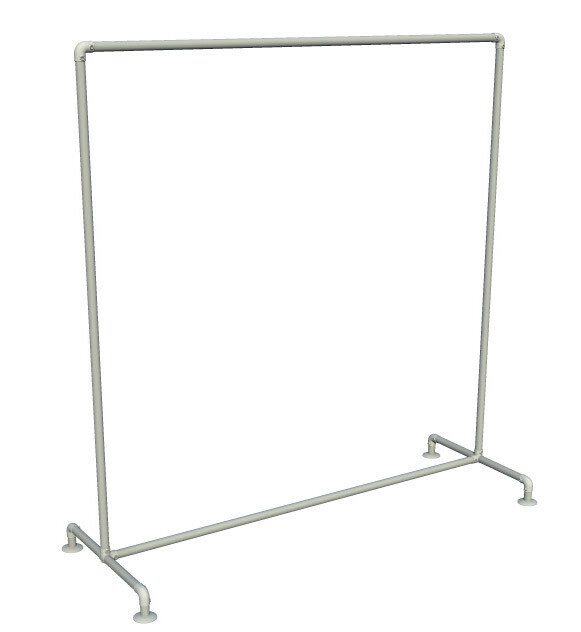 This single bar clothing rack features a "box-like" appearance and structure to create a more "heavy-duty" rack. The 90 Degree Elbow and Singlet Socket Tee fittings are used in this rack. 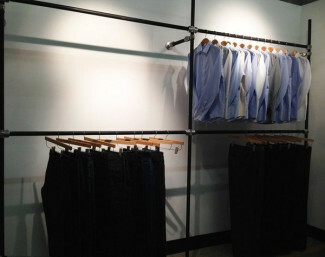 These clothing racks at San Lorenzo Bikinis' retail store features two levels, each with four bars for hanging clothing. The pipe and fittings were painted white to match the store aesthetic. A Collar fitting is used at each pipe end (used for hanging clothing) to keep clothing from sliding off. We have a similar four-way rack with only one level, that you may want to check out too. 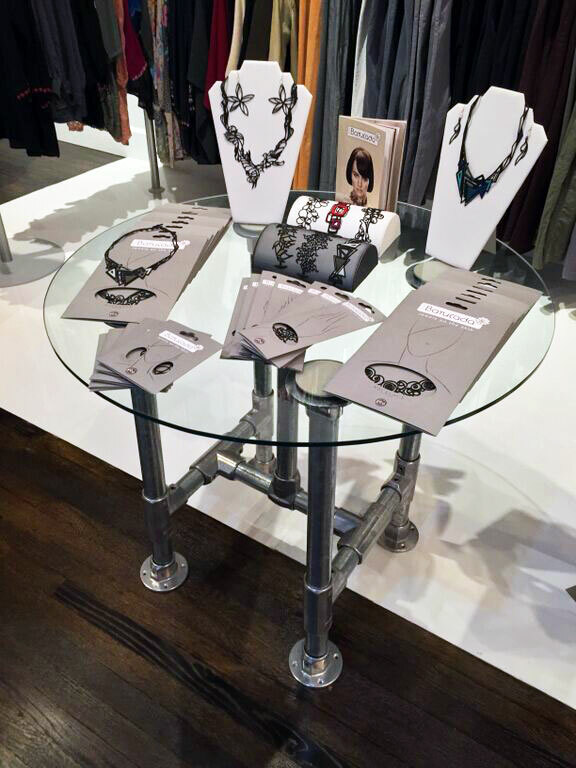 This display table is featured in the Broad Street Clothing retail store in Thomasville, Georgia. The table utilizes a pipe frame in combination with a round, glass table top. 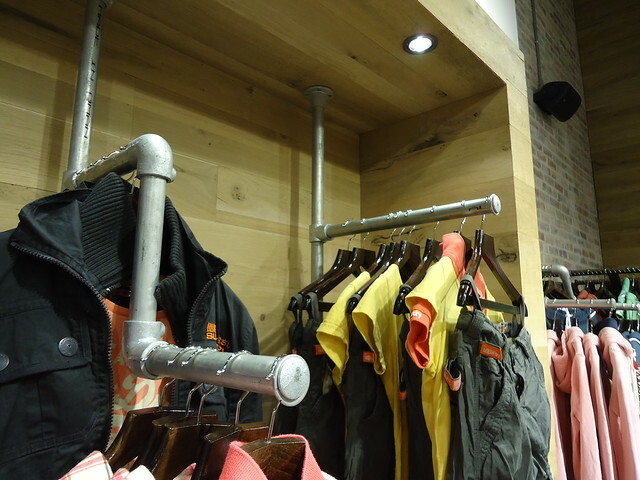 The pipe frame uses oversized pipe fittings (specifically size 8) to enhance the industrial look and match the clothing racks already in the store. Read more about the project here. 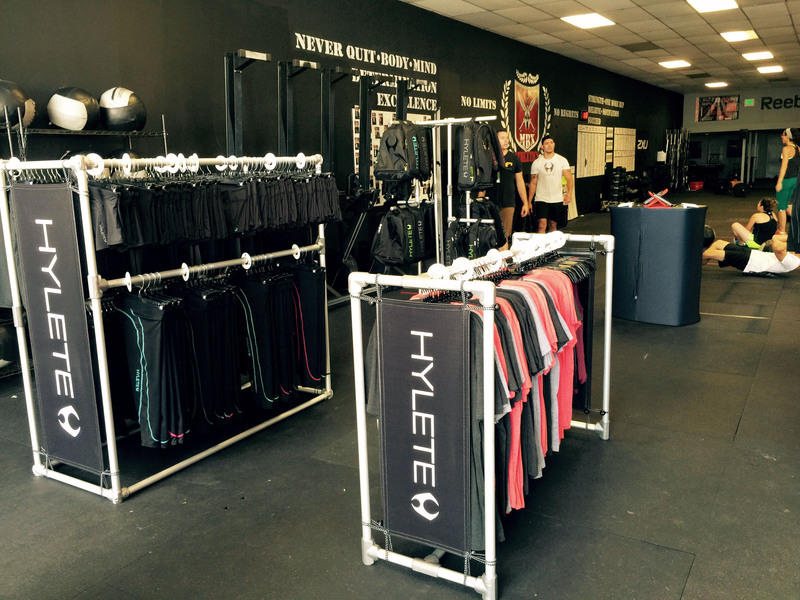 These heavy duty racks are featured in a surf shop in Northern Wales. 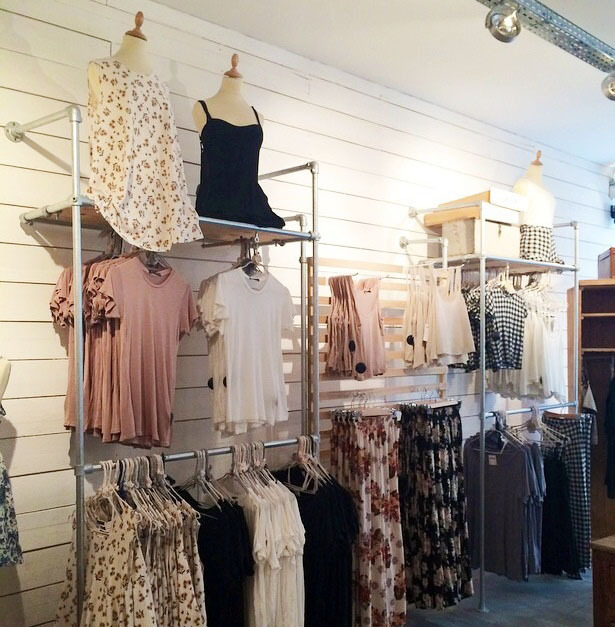 The oversized rack create a commanding appearance and adds to the aesthetic in the shop. Read more about this project here. 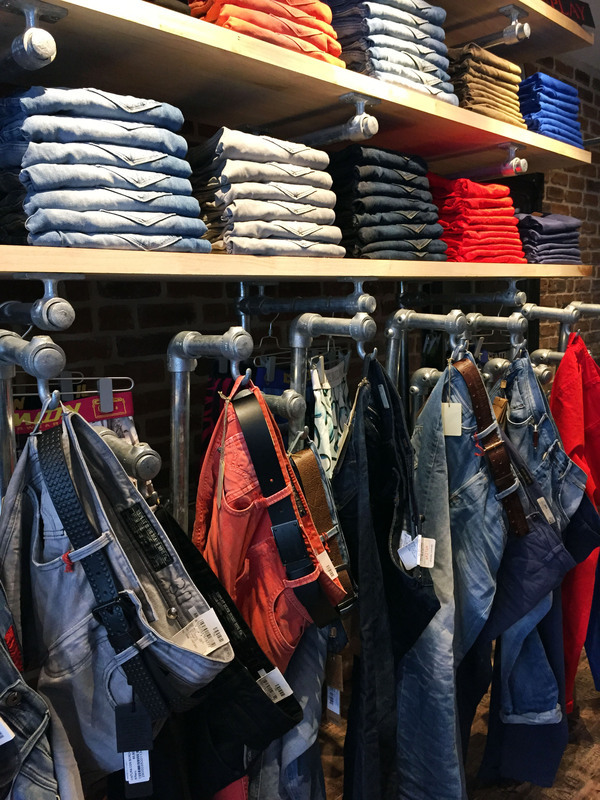 These free standing racks are featured in Renew Denim's retail store in Davis, California. Flange fittings are used for the rack "feet" and the Single Socket Tee fittings are used to create intersections in the rack frame. Read more on this project here. 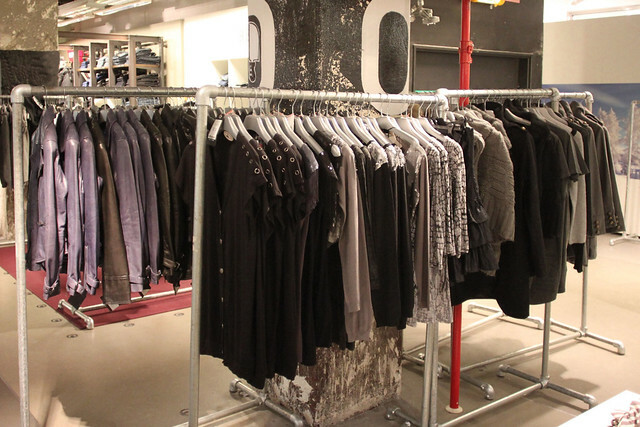 These clothing racks are featured in a boutique shop in Paris, France. The simple design features one bar for hanging clothing. If you're interested in this design, we have a similar clothing rack kit for easy setup. Read more about this project here. 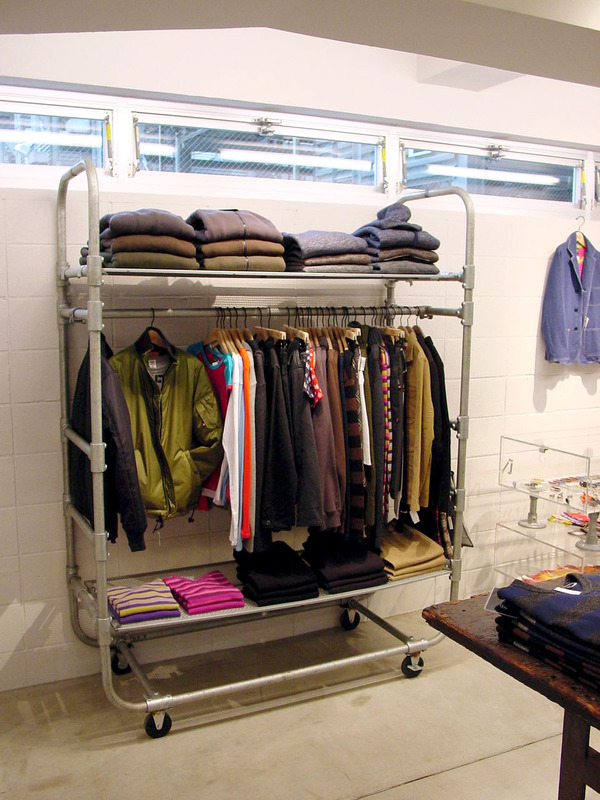 This rolling clothing rack features a single bar for hanging clothing and two shelves for folded clothes. This specific design use pre-bent pipe but the 90 Degree Elbow could be used in its placed when using straight pipe. Also, while this design uses a different style of casters, our Kee Klamp Casters make it easy to add casters to pipe (they slide right into the exposed pipe end). 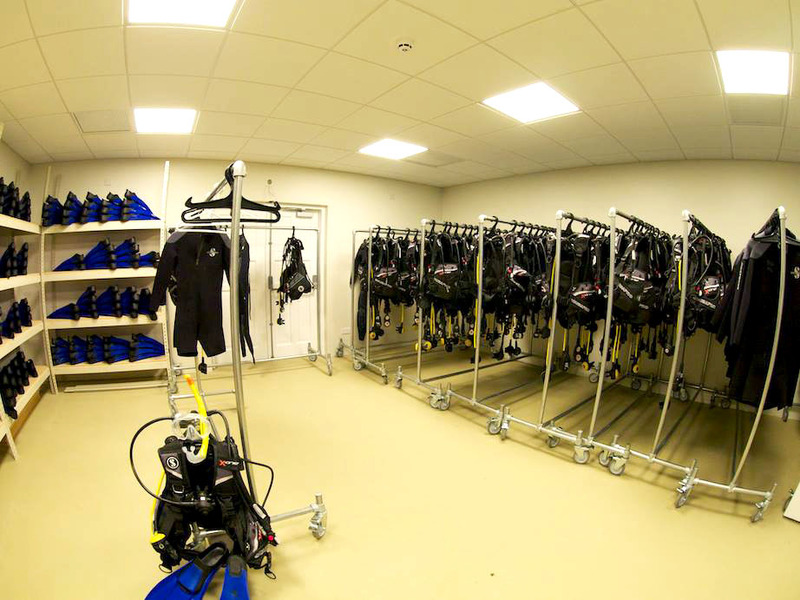 These clothing racks are used at a dive center to hang heavy scuba equipment when drying and not in use. 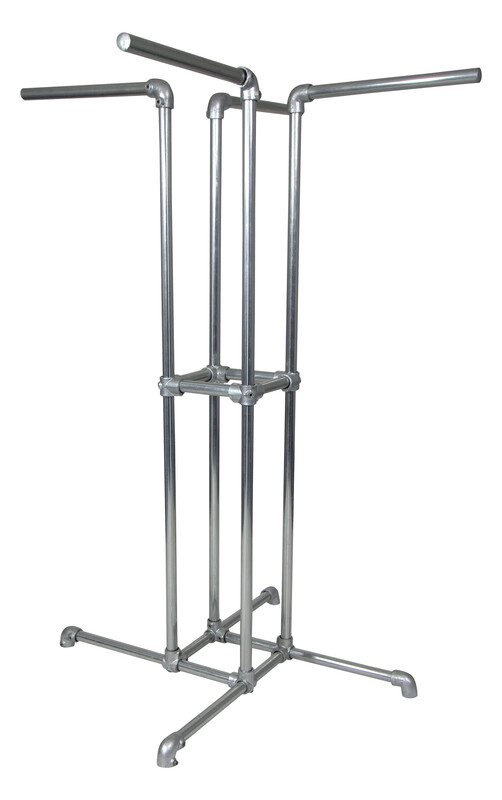 They make use of our Free Standing Clothing Rack Kit with the casters option. This rolling shelf is used to display stackable merchandise. Casters on the bottom of the frame slide into the exposed end of pipe and provide for easy mobility. If you like this project, I'd also recommend checking out this rolling bookcase. It has a similar design and may work for your application. "We completed the build out of our new shop with Kee Klamp pipe fittings from Simplified Building. The crew there was great to work with, and our initial apparel rack systems turned out so well that we went back for more! 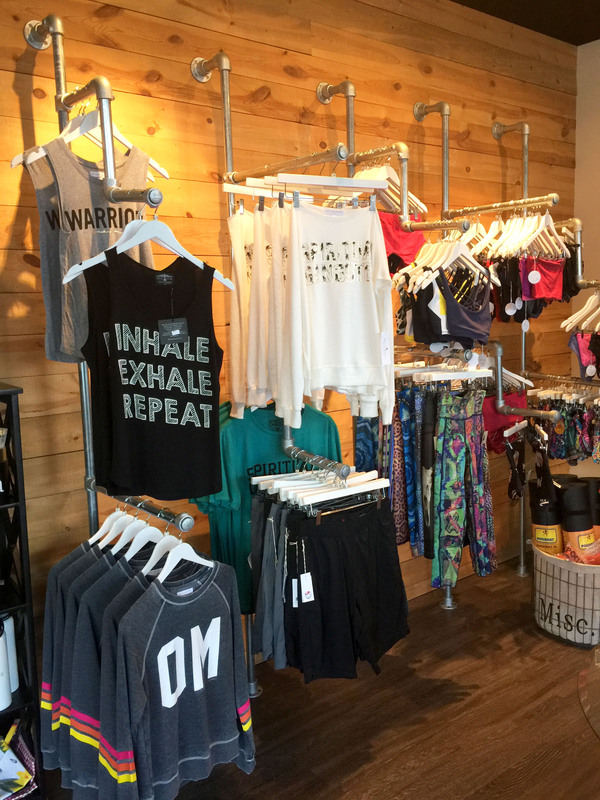 We wanted to expand the apparel sections in our store, so we customized the apparel displays to attach to the window frame of the shop - turned out great! 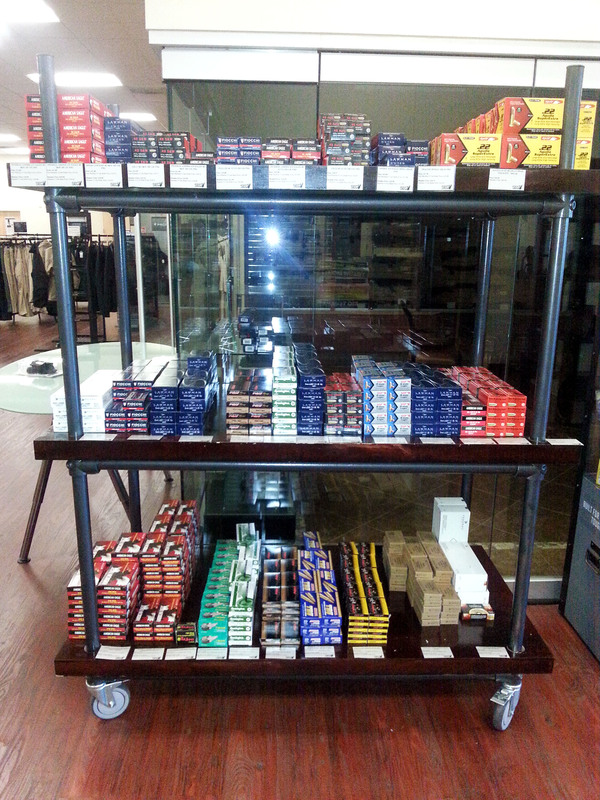 We added shelving to the top of the floor fixtures, and it gave our retail space that added pop! Another great project completed with the help from the guys at Simplified Building. Thanks guys!!!" 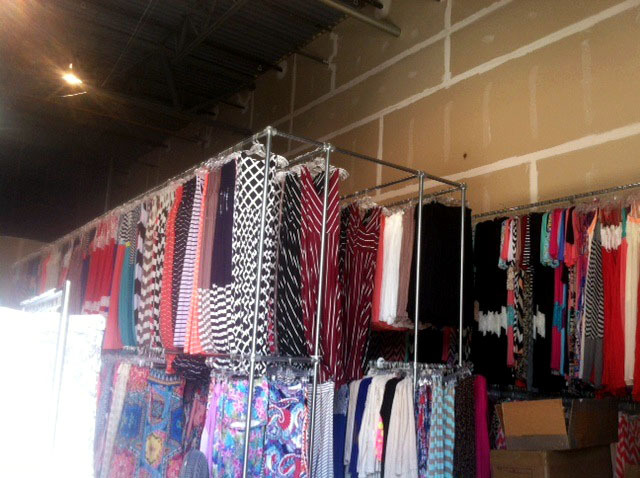 These clothing racks are featured in a Las Vegas clothing boutique and were put together using our Free Standing Clothing Rack Kit with the casters option. These kits are configurable in height and width. Read more about this project here. 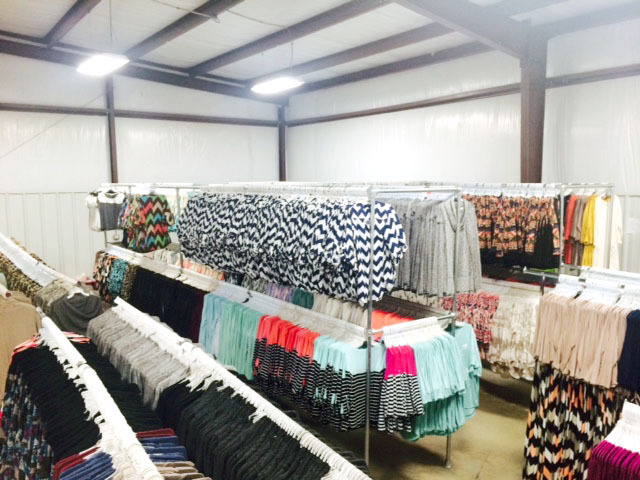 These clothing racks were built by one of our customers to hold thousands of garments in their warehouse storage. If you want to put together a similar rack, I'd recommend reaching out to our projects team for free design assistance to ensure the rack will support the amount of weight. 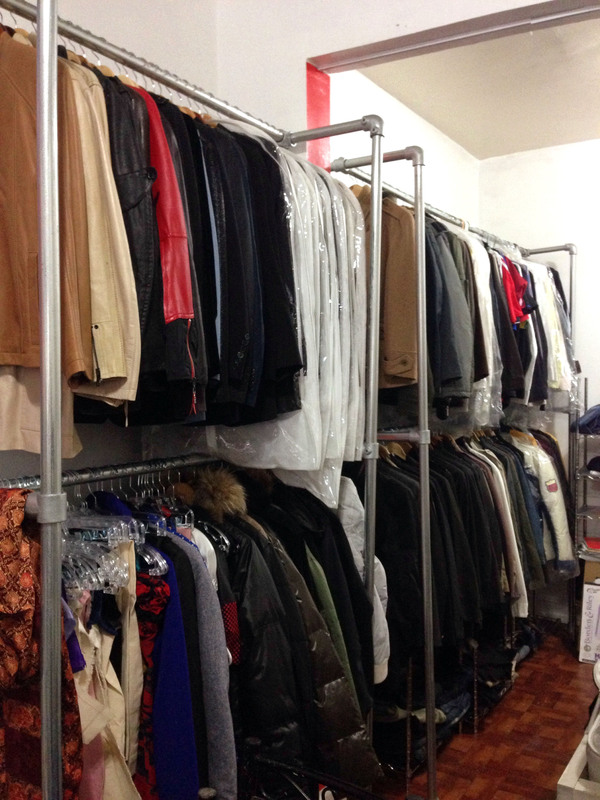 These industrial clothing racks are used by Modern Vintage Boutique to hang items in their warehouse. The owners appreciated the quality and setup of using Kee Klamp in the construction of the racks. Again, be sure to reach out to our projects team to ensure the rack will support the amount that will be placed on it. While not technically a retail store, the signage in this cafe is created using Kee Klamp fittings and could be a possibility for stores using Kee Klamp built clothing racks to tie in the look. 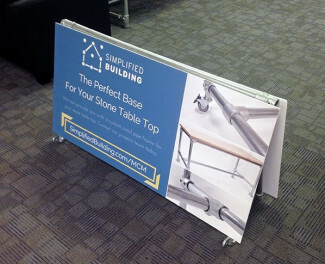 The sign frame is created using the 90 Degree Elbow fitting. Signage can be attached to the frame multiple ways, such as using our M50 fitting, the Single Sided Clip, or even bungee cords (like the design below). This wall mounted frame adopts a simple design to showcase a banner or advertisement. Essentially, a large square or rectangle, the banner is attached by stringing banner bungees or zip ties through the grommets on the banner and then around the pipe just to the side of it. 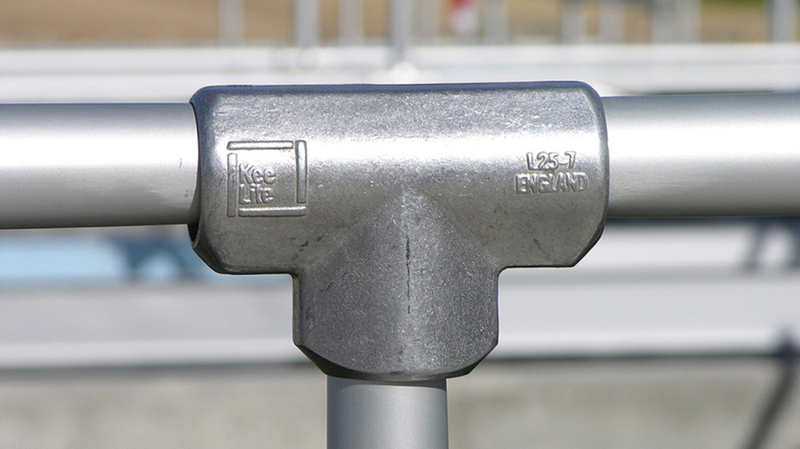 90 Degree Elbow fittings are used to create the bends in the sign frame while Rail Support fittings are used to attach the sign frame to the wall. Read more about this frame and check out others like it here. 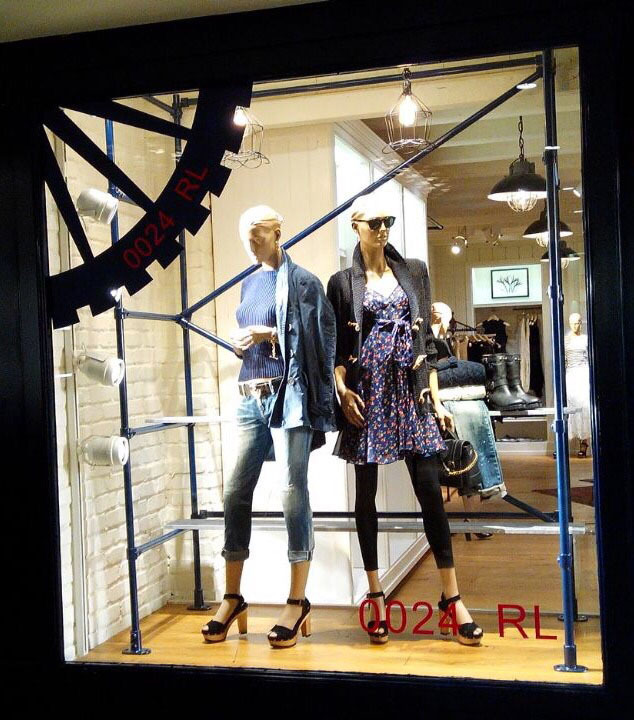 These displays are featured in the window of a Polo Ralph Lauren store. 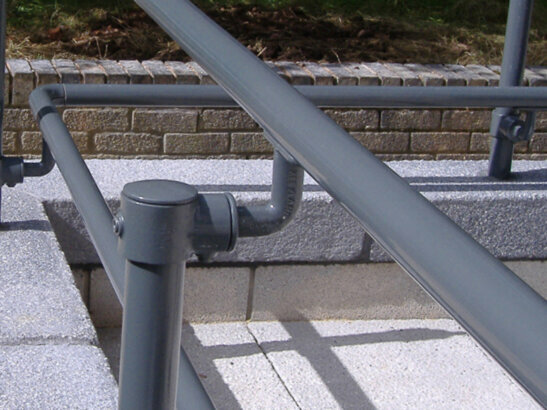 The structure emulates a scaffold and is attached to the ground using the Standard Railing Flange. 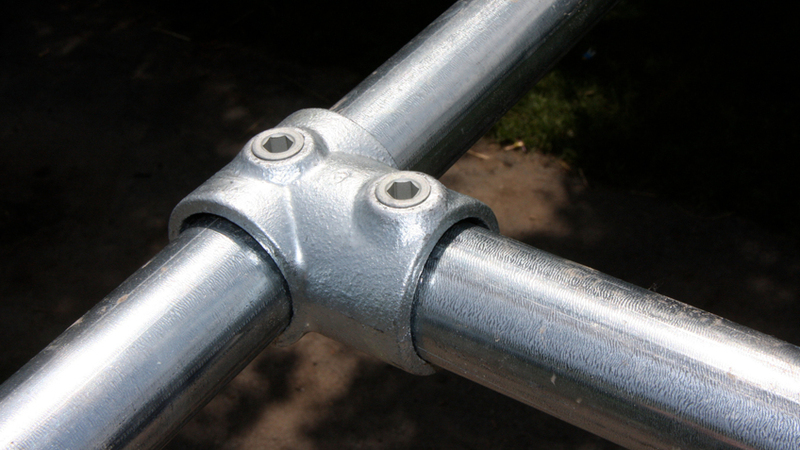 The "ladder rungs" are created using the Single Socket Tee fitting. 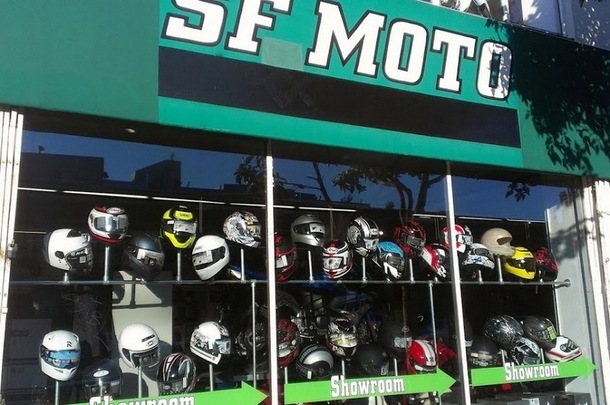 This unique display is used to showcase different helmets in the window of this motorcycle shop in San Francisco, California. The helmets are placed onto vertical sections of pipe connected to the horizontal bar using the Single Socket Tee fitting. The entire structure is mounted to the wall and ground using the Flange fitting. Read more about this project here. Well, that's it! 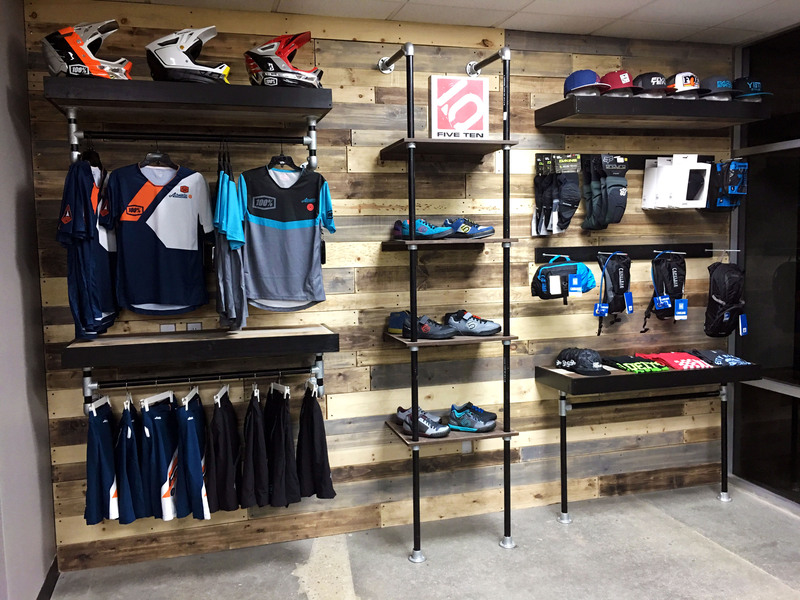 39 retail display ideas to hopefully spark your imagination and inspire your own build! Remember to check out our kits page for clothing rack and table kits. Also, if you need any help with ordering or coming up with a custom design, don't hesitate to reach out to our projects team for free design assistance.